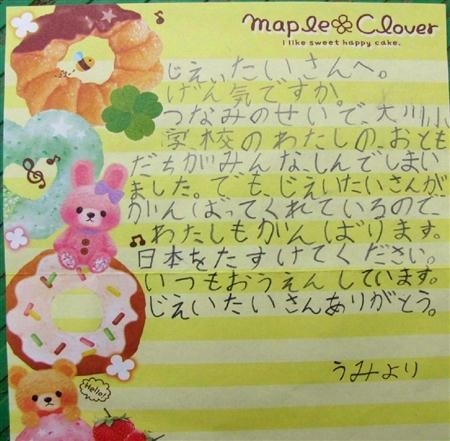 This is a heart warming thank you letter to the Japanese Special Defense forces from a little girl who lived in Ishinomaki City, Miyagi Prefecture. 70% of the children in the city were wiped out by the tsunami wave. Copies of the of the letter were handed out to each member of the special forces and has become a source of strength for those who are still tirelessly laboring in the disaster area. All of my friends from Okawa Elementary School died because of the tsunami. But since you are doing your best, I am going to do my best too. Mr. Special Forces, Thank you.